The ridiculous dialogue you can get out of your Animal Crossing citizens is pretty endless. They do often tend to be insecure creatures, though, don't they? But that's ok, because they're our townspeople and we back them up. Unless they're annoying rhinos. Then they can GTFO of my town. Best part is that I stole him from a friend&apos;s town. 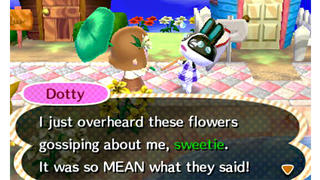 Yeah, teach those flowers not to gossip, Breezy. Welcome to the Animal Crossing blog run by myself, Kirk, Patricia and reader Sam. If you want to contribute, feel free to start writing up stuff on your Kinja blog and tag it "Animal Crossing." I'll do regular searches and bring over the best stuff onto this blog. Maybe we'll even add you as an author! You can always email me with stuff, too.